Many of the questions focused on Fedor's recent fight in the BODOGFight "Russia vs. USA" tournament, held in Saint Petersburg on April 14. Q: Lindland admired your armbar in his last interview. He indicated that he has never seen it done that way before, and that it was an unusual way to do it. He said that he did not think he was in danger until he felt his arm straighten. What was it? Sambo? Jiu-jitsu? Catch wrestling? Something new? A: That submission was standard, the implementation was mine. I blocked his arm by squeezing it very tightly with my legs. Q: Did you see the fight between Gonzaga and CroCop in the last UFC? What did you think of Gonzaga? What was CroCop's mistake? A: I saw that fight. It was clear that Gonzaga had studied CroCop very well, and he was able to do some things that other fighters had not done before. That is, he followed a predefined plan. He had a very intelligent strategy. CroCop could not get into the fight, even though his level of skill was above Gonzaga's. so used to seeing from you? A: There was no need for it. I felt that I will be able to win via submission. Q: Dana White said recently that the losses of former Pride fighters in UFC show that the level of Pride fighters have always been inferior to UFC. What's your opinion of the UFC fighters, for example, Couture, or Arlovski? A: I don't think that fighters in Pride are weaker than the ones in the UFC. In my opinion, the Pride fighter roster is stronger. I really like Randy Couture; I really respect him as a fighter and as a person. He deserves admiration. Andrey Arlovski is a very tough fighter, and I like his matches. Although, he does not always use his strongest qualities. Q: Do you have any experience with elbow strikes? Is it going to be hard for you to adjust to the UFC rules if you compete in that organization? A: I do use elbow strikes, and I am working on that technique. I don't think I'll have any difficulties with the rules. Q: Hello, Fedor. I am 17 years old, and I live in Yakutsk, Russia. I'd like to come to the Red Devil club and study Mixed Martial Arts. Do you have a special program for out-of-towners? Is it possible to train with you, personally? A: We now have an academy in Saint-Petersburg that's associated with the Red Devil club, and we have a gym. So far we haven't worked with visiting fighters. It is possible to train with me, but that's more likely in Stary Oskol, since I am there more often. Q: Fedor, some websites say that in 2001 you fought with Martin Lazarev in an MMA match at the RINGS Russia vs. Bulgaria II show. More established sited do not have that fight. Did it really happen? A: I did "fight" with Martin Lazarev, but that was in 2000. I won via a choke. Q: I read in one of your interviews that you were thinking of becoming a politician. Is it true? If so, then why? In my opinion, athletes who become politicians lose the respect of their fans, and don't achieve anything notable in politics either. Look at Karelin, for example. A: I am not planning to become a politician. Q: My name is Cyrill. I am 14, and I've been studying boxing for two years. Can I come from Saint Petersburg to Stary Oskol and join your training camp? What should I do? Who should I call? A: Why don't we start small. Let's meet in Saint Petersburg in the Red Devil club. Q: Where does your nickname "The Last Emperor" come from? A: That's what the Japanese fans call me. Q: Hello, Fedor! When are you planning to retire? Are you afraid of losing and retiring defeated? A: In the nearest future we'll sign a contract for a year or two, so I am not planning to retire at least for that long. I try not to think about losing, and I will not lose on purpose. Q: One notable characteristic of Russian fighters is that they are completely calm before and during the fight. It's impossible to see any signs of nervousness. Where does this calmness come from? Is there some special psychological training? A: There is no special training, it's just a character trait. As one gains experience, one learns to get one's emotions in order for a fight. Q: What's more important for you as a fighter: the ability to earn good money, or the worldwide popularity and fame of the best fighter in the heavyweight division and in all of MMA? A: All of these factors are important for me. Remaining the best heavyweight fighter is the most important one. Q: Is there and particular fighter you would like to compete with in the future? A: Yes. Rulon Gardner, the Olympic champion who defeated Aleksander Karelin. Q: Are you planning to hold a seminar in Finland? A: I haven't received any offers to do that so far. Q: Do you ever have dreams where you are in a ring, and do you usually win, like in reality, or does the fight not go according to plan? A: I do sometimes have dreams where I am fighting, but I don't try to remember those dreams or try to attribute any meaning to them. Q: Why didn't you take part in the filming of the "Pride Decade" program? A large part of the program was dedicated to you, and everyone said that you are the greatest fighter in the world. A: I haven't received any offers to participate in that program. This is the first time I hear about it. Q: I'd like to know the status of the championship belt, although it is just a formality. Since you are not under a contract right now, and since you are in negotiations with Zuffa, have they threatened to take away your title? Do you still have your championship belts? A: During the first stages of negotiations there really were threats to take away the title. At this point, it's no longer a problem. It seems that we have found some common ground. My championship belts are in a sports academy in Stary Oskol, so that kids who study there can see them and have something to strive for. Q: When are you going to compete in Russia again? Where is it going to be? A: One of the conditions of our next contract will be participation in the next Mix Fight show in Russia. It's planned for next year, and will be held, most likely, in Moscow, in the Fall. Q: Do you prefer rules that include elbows and a cage, or a ring and no elbows? A: As far as I know, from now on UFC and Pride will have identical rules. Q: How is your youngest brother, Ivan, doing? How's Cyrill (Sidelnikov)? Have they recovered from the injuries? A: Ivan is not going to compete in MMA. Cyrill is progressing well. He has recovered from the injury and has started training again. Q: How was it talking to Putin? Any memorable moments? A: We had tea with Vladimir Vladimirovich and discussed various topics. He mentioned that he watches the fights when he can and that he is very interested in our performances. Q: How did you like competing in Saint Petersburg? Was the support even remotely close to the Japanese 40,000 people shows? A: I liked it a lot. Our audience is on par with the Japanese fans. We could feel that people in the audience weren't watching MMA for the first time, and that they understood what was going on in the ring. Pride needed several years to get to that point in Japan. Q: The most common topic on English-language forums after your fight with Lindland was whether the ropes helped you, and whether the rules were broken. A: I didn't hold the ropes, I leaned on the top rope, and it was not a conscious reaction. I don't think that the rules were broken. Q: Were you afraid that the fight was going to be stopped because of the cut? Was that the reason that you applied the armbar that fast? A: I tried not to think about the cut. I continued to fight in my normal pace, and focused on making the right decisions. A: Of course. We have to support the president's plans, right? Q: All the best to you. Good luck in building the house, and having more kids. And good luck in cranking up the submissions, like you did with Lindland - they don't deserve any breaks. A: I didn't want to crank the submission like that, it happened only because I felt that Matt could escape the position. I really respect that fighter; he reminds me a lot of Randy Couture. Q: I noticed that you rarely use strikes to the liver (well, except for the fight with Goodridge). Why is that? A: I attack the places that I see as targets in that particular moment. It happens automatically. Q: What do you think about "spiking" - throwing the opponents on the ground head first? Have you ever had an opportunity and the desire to throw someone that way in a fight? A: I had opportunities like that, but I never had any desire to spike anyone. Q: Do you have any fears or phobias? Q: Would you accept a challenge from any fighter? A: I'll accept a challenge from anyone, as long as the contract is fair. Q: Do you consider yourself the best heavyweight fighter in the world? A: I never considered myself the best fighter. A: Yes. Yuri Vlasov, Soviet weightlifter. Q: Do you think one of your brothers might take your place in the future? Is that something you want? A: I'd like that, but I am afraid it will never happen. A: I eat everything - and there is a lot of good food out there. Q: Do you follow a diet? What is it? A: I don't have a diet. My only rule is that I try to eat less fatty food and avoid cakes and candy. Q: Do you have any "surprises" that you have not utilized in your fights yet? A: My coach thinks that I've shown only 50% of my capabilities. Q: Do you usually have a game plan, at least for the first moments of the match? A: I don't usually have a very defined plan, but I do have certain things sketched out. Q: You missed a punch during the first seconds of your fight with Matt Lindland. Was it unexpected, or were you unable to react fast enough? A: I saw that punch, but I misjudged the distance a bit. Q: Do you think that your future opponents will try to use the same strategy against you: throw a quick punch without getting into a heavy exchange, use the momentum to push the fight to the ropes, and attempt to take the fight to the ground trying to gain the top position? A: I'll take that mistake into account. Q: Are you going to prepare to counter this strategy? Q: How would you rate the leglock you applied in your last fight? A: I accomplished what I wanted. Q: Are you planning to do leglocks more often? A: I am working on my submissions, and I'd like to get them to be perfect. Q: How was your vacation? A: It was great, very relaxing. I loved going to the gym. Q: Matt Lindland said in his interview that he'd like to have a rematch. Do you think he will be able to perform even better? A: I'd like to have a rematch with Matt. He is a very interesting fighter. Q: Fedor, when are you competing next? A: At this point, I can tell you that I will definitely compete in the World Combat Sambo Championship in Czech Republic. I don't have an MMA contract at this moment. Q: Who do you consider to be the most dangerous super-heavyweight in Pride and in the world, besides yourself? A: My coach just walked in, and I think it's probably him. I am afraid of him more than anyone else. He can leave me without breakfast, lunch, and dinner. Q: If you could fight any fighter in the history of combat sports, who would it be? A: I never thought about that. Q: Would you like to fight in K-1? A: We haven't received any offers from K-1. Q: You work with every athlete in Fedor's team and in Red Devil. Why is it that none of them have been able to approach Fedor's level? There is a huge gap between them. What is the reason? Fedor says that he does not have any special genetic traits he was born with. 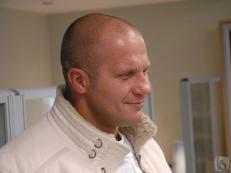 A: When Fedor started competing in MMA, he already was an International Master of Sport in Judo and Sambo. We've been working with Red Devil for three years now, and a lot of the young fighters have really improved, but this amount of time is just not enough to reach Fedor's level. Q: Besides training established fighters, do you train beginners, or do you only work with professionals? A: The guys that join our team come from a variety of combat sports, and they usually have zero striking skills. If they don't have enough willpower and patience, there is really no place for them in this sport. Q: As a coach, how early do you think one should start training in MMA? What is the best background for it? A: It's hard to say. The best age is probably around 16 or 17, but they should have some experience in one combat sport or another. Q: How do you select people for the team? Do you have anyone from other regions of Russia? A: We have guys from completely different parts of Russia, anywhere from Caucuses to Moscow. They just haven't competed yet. Really, we don't invite anyone personally to the team. The guys just find us themselves. Q: What were the reasons for the losses of our guys to the Americans in the St.Petersburg show? A: First of all, only Yulia and Dmitriy Samoilov lost their matches, and both of them were leading on points. Samoilov did not have enough competition experience, and Yulia simply did not follow the plan developed by the coaches. Q: There are a lot of questions about Aleksander (Emelianenko's) shape. The fight with Pele left us with more questions than answers. What are your comments? A: Aleksander was not there in the first stage of our training camp in Kislovodsk, and that affected his shape. As far as the fight goes, you really should ask Aleksander himself, since he prepared for this fight on his own. Unfortunately, Fedor and Vladimir Voronov couldn't answer all of the questions in the time allotted for the online meeting. Fedor thanked the participants for their support and care, and promised to answer the remaining questions very soon. In turn, we promise to publish the answers when they become available.